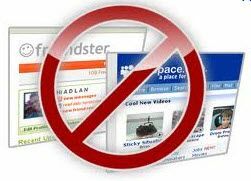 Over the years, many customers have asked me how to block websites so their employees will not be distracted by social media sites. Since new websites pop up every day, a company would need to subscribe to a service that groups websites into different categories. From there, company management can determine which categories of websites to block. Smaller companies or even home offices can block websites on each individual PC. This is down via the Windows hosts file and doesn't even require purchasing any third party software or service. It's not well known, but it is easy to do. To do this for an individual PC, all one has to do is open Windows Explorer and type in C:\Windows\System32\drivers\etc. From there, click on "hosts" and use Notepad to make edits. Simply add each URL you want to block at the end of the entire string of text and those websites won't be accessible any longer. Check out this PC World article for a step by step guide on how to do this. Instead of global blocking for individual computers, selective blocking can be instituted at the router level. Each manufacturer brand will vary but the general gist is to login as admin and go into the settings where there should be an area to allow you to block URLs, computers and access during specific times of days. After telling my users how to implement these Internet blocking solutions, I will often tell them that any method that blocks websites may not be the best way to encourage productivity on the part of their employees. First of all, with the advent of smartphone technology, it is virtually impossible to block your employees from accessing social media sites. And, as of early 2012, social network has had nearly 1 billion users, so it’s reasonable to assume that your employees are social media users as well. As our own breakthrough industry survey found, 87% of HR professionals say they allow the use of personal smartphones at work, and almost 58 percent of them are concerned that those devices may be used to access social networks. Also, a blocked website can sometimes have a legitimate business use. One of my friends that works for one of the world’s largest semiconductor manufacturers told me one time, “My company blocks all social sites, game sites and shopping sites at work. It’s so hard to use.” Employees usually have no desire to raise issues with the company’s management regarding which sites should be opened. As a result, a company’s productivity is often silently subdued, and there are no ways to measure it. Another problem is that different users may have different needs to access websites. For example, while management may not wish to let most users access banking websites, it is necessary for the accountants to perform online banking for the company. A solution that works at the firewall level often lacks the finite control capability to allow this. Lastly, the biggest problem with blocking websites is that it only passively prevents users from doing something; assuming that “something” is nonproductive. If your employees do not feel like doing anything productive, I can assure you that they will find some other ways to kill time without visiting those blocked sites. A recent Cisco study shows that 56 percent of college students globally said that if they were offered a job at a company that banned access to social media, they would either turn down the offer or ignore it. It is clear that we need another solution to replace the convention wisdom of Internet blocking. The key to managing employees’ productivity is to engage their time, not by restricting access to certain websites through heavy-handed policies. Measuring the amount of time an employee spends being productive is the best way to help that employee achieve his/her maximum potential. That is the essence of MySammy, which is a "time engagement solution" that helps companies monitor, measure and improve their productivity. MySammy is designed as a quantifiable measurement solution to engage users’ time. Management can compare data of multiple employees to set a baseline and use it for performance evaluation. The benefit against blocking websites is a greater empowerment of your employees, higher worker satisfaction and addressing the core issue of productivity. Sign up for MySammy for free today with no obligation and no time limit on your account by selecting the Starter plan here. Read how MySammy personally used their own product to measure and improve the productivity of their remote worker by Clicking Here.